A victim of a Colombian volcano disaster, Omayra Sanchez was trapped in water and concrete for three days. This photo was taken shortly before she died. On November 13, 1985, the Nevado del Ruiz volcano erupted. Pyroclastic flows exploding from the crater melted the mountain’s icecap, forming lahars (volcanic mudflows and debris flows) which cascaded into river valleys below. One lahar, consisting of three pulses, did most of the damage. Traveling at 6 meters (20 ft) per second, the first pulse enveloped most of the town of Armero, killing up to 20,000 people; the two later pulses weakened buildings. Another lahar killed 1,800 people in nearby Chinchiná. In total 23,000 people were killed and 13 villages in addition to Armero were destroyed. 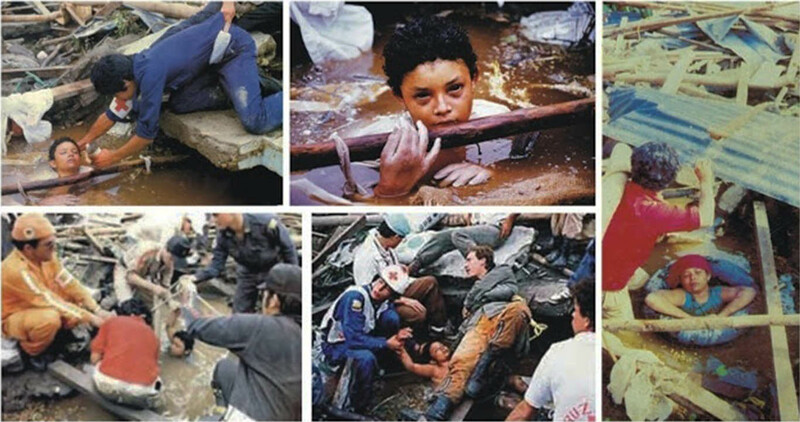 Omayra Sánchez was a little 13 year old girl who lived in Armero when the “Nevado del Ruíz” erupted. When the lahar destroyed her house, her father and aunt died inside. She was able to survive the lahar, but when rescue teams tried to help her, they realized that her legs were trapped under her house’s roof. Once the girl was freed from the waist up, her rescuers attempted to pull her out, but found the task impossible without breaking her legs in the process. Rescue workers placed a tire around her body to avoid her to drown. Divers discovered that Sánchez’s legs were caught under a door made of bricks, with her aunt’s body under her feet. At one point she asked the people to leave her so they could rest. Despite her predicament, Sánchez remained relatively positive: she sang to Germán Santa María Barragán, a journalist who was working as a volunteer, asked for sweet food, drank soda, and agreed to be interviewed. At times, she was scared, and prayed or cried. On the third night, Sánchez began hallucinating, saying that she did not want to be late for school, and mentioned a math exam. Near the end of her life, Sánchez’s eyes reddened, her face swelled, and her hands whitened. At one point she asked the people to leave her so they could rest. Hours later the workers returned with a pump and tried to save her, but her legs were bent under the concrete as if she was kneeling, and it was impossible to free her without severing her legs. Lacking the surgical equipment to save her from the effects of an amputation, the doctors present agreed that it would be more humane to let her die. In all, Sánchez suffered for nearly three nights (roughly 60 hours) before she died at approximately 10:05 AM on November 16 from exposure, most likely from gangrene or hypothermia. Divers discovered that Sánchez’s legs were caught under a door made of bricks, with her aunt’s body under her feet. I could hear people screaming for help and then silence – an eerie silence. It was very haunting. There were a few helicopters, some that had been loaned by an oil company, trying to rescue people. Then there was this little girl and people were powerless to help her. The rescuers kept coming back to her, local farmers and some people who had some medical aid. They tried to comfort her. When I took the pictures I felt totally powerless in front of this little girl, who was facing death with courage and dignity. She could sense that her life was going. By this stage, Omayra was drifting in and out of consciousness. She even asked me if I could take her to school because she was worried that she would be late. I gave my film to some photographers who were going back to the airport and had them shipped back to my agent in Paris. Omayra died about three hours after I got there. The picture was published six months after her death, and later won the World Press Photo of the Year for 1985. Omayra’s face became worldwide known. Today, she remains as the symbol of the Armero tragedy. Her tomb is visited by local and tourists to offer her a prayer and ask to never repeat this tragedy.